This is our first year filling out the FAFSA (Free Application for Federal Student Aid). This important form gives my daughter access to a variety of federal student grant and loan options, such as the Pell Grant and Perkins loan. While I filled it out over 20 years ago, a lot has changed since then. See what's FAFSA changes you should be aware of right away! Unlike previous years, in which you filled it out in the spring of the year you hope to attend college, the FAFSA is open October 1st for the next year. So, for the 2017-2018 school year, you would want to start applying October 1st of 2016. That's now! Get your form in as early as you can. Aid from colleges that are determined by the information received on the FAFSA is usually first-come, first-served. Kids will be competing for need-based scholarships at schools much earlier this time around. 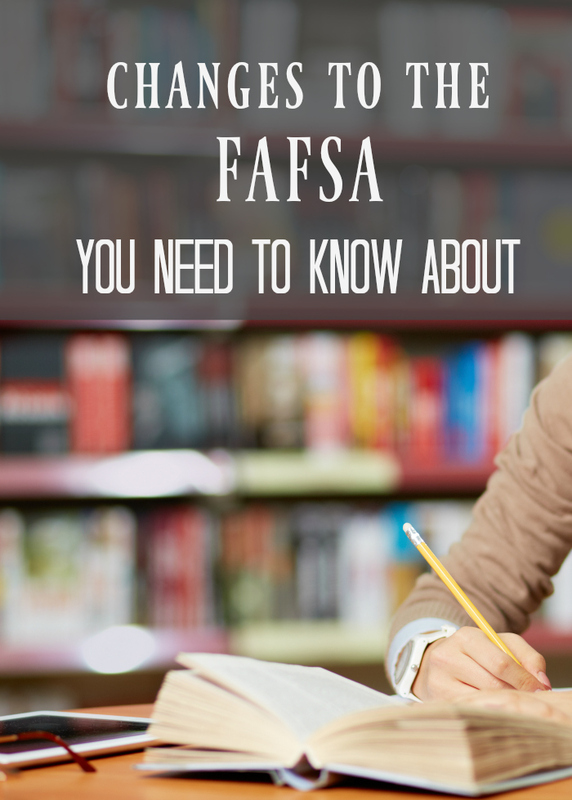 Do you know what tax information you'll need to include on this year's FAFSA? Read carefully, because for money requested for ths 2017-2018 school year, you'll use your 2015 tax info. That's right... if you filled out last year's FAFSA, you also used 2015 info for that one, too. As the changes roll out, you'll be able to use the previous year's tax info for the following year's school year. Confusing? It's actually very simple, since most people have their tax info handy for that time period. You simply carry over some key info from certain lines of your form, and you're good to go! These FAFSA changes are actually quite convenient. I made a lot of money in 2015, but now my financial situation has changed. How do I qualify for the money I should get? FAFSA requires 2015 info for the 2017-18 school year. You can't get around this. But you can put your application in and then speak to your school to make an independent determination of aid. Most financial aid offices are authorized to work on your behalf to make sure federal aid accurately reflects your need. So put the app in and give you school a call right away. I'm helping my child fill out the FAFSA. Do we each need our own FAFSA ID? Yes. The student will need to have their own ID, and the parent helping will also. You should both set up your own ID's here. You'll have passwords and security codes unique to each of you. The FAFSA asks for schools to be listed, but my child doesn't know where they are attending yet. What do I do? Since the FAFSA needs to be filled out so much earlier, it's likely that your child hasn't figured out where they want to go. The form allows for up to 10 schools to be listed, so you could either list all of the schools you think you might be interested in OR you can list at least one in-state school and then come back and add schools as you get more information. How long does it take for FASFA to be processed? We did our FAFSA on October 2nd, the second day it was available for the 2017-2018 school year. This was a Sunday evening, and by Monday morning, we were notified that it was accepted sent on to the schools on our list. Schools should have your information within a week, although they may not begin working on your aid package until their own timelines. You will at least be able to see your EFC (Estimated Family Contribution) at the time you submit your FAFSA. This information is helpful when using online calculators that estimate your net cost for admission. Have any other questions about the FAFSA changes? See the FAFSA website. We're also launching a college planning toolkit for homeschoolers. It's coming soon, so sign up to be notified below, and you'll get an instant freebie to help you plan! Our college planning toolkit for homeschoolers launches soon. Sign up to be notified and get your FREE ACT/SAT Target Worksheet! Yes! You're all hooked up! Now, check your email inbox for that ACT/SAT worksheet we're giving you!